Vintage USSR porcelain giraffe figurine. The giraffe is unmarked. Condition: good, no chips or cracks. Please check the photos as they are part of the description. Thank you for looking. We aim to dispatch all items within 2 working days of cleared received payments. Please leave feedback if you are satisfied with the item. We will be listing more items over the coming days and weeks, please feel free to browse. We do not accept “Buy it now” offers. 1950s Lomonosov ceramic giraffe. Marked USSR in red, with the number 25 in black. It measures 9 3/4 inches tall. It has fine crazing all over and the ears have been repaired at some point, please see photos. It will be packed with care in a sturdy plastic tub for protection during transit, and sent 2nd class recorded within the UK. Unpacked weight is 185g. We are happy to ship within the European Union, but will only send tracked. PayPal only and payment within 2 working days please.
. See all the pictures below. Vintage Lomonosov USSR rough collie sheepdog. Condition: good, no chips or cracks. Please check the photos as they are part of the description. Thank you for looking. We aim to dispatch all items within 2 working days of cleared received payments. Please leave feedback if you are satisfied with the item. We will be listing more items over the coming days and weeks, please feel free to browse. We do not accept “Buy it now” offers. Dispatched with Royal Mail 2nd Class. Marked ‘Made in USSR ’to bottom. Right ear has been repaired (see last 2 pics). Otherwise in v erygood condition. There is a small factory fault on the mane, which has been over-glazed - does not detract from this lovely piece. Heavy, just under 1.3 kg. One raised mark to the glaze which will have been made during the firing process. Lomonosov, USSR, made this lovely porcelain model of a seated French bulldog/Boxer dog in the tan colour finish; it has a faint red Lomonosov MADE IN USSR mark on the base edge just visible [see photo]. Lomonosov CCCP Plate, Sixty Years of Education in the USSR. This is a porcelain plate made at the Lomonosov factory pre 1991. Personally, i adore tigers especially Siberian. tigers and this tiger is magnificent. LOMONOSOV SHIRE HORSE, 5 INCH HIGH. THIS IS A LOMONOSOV SHIRE HORSE. On base is the Lomonosov mark & made in USSR. It will be a perfect gift for animal lovers. It's also a perfect addition to any porcelain collection. 7.25 cm in length & 11.5 cm at highest to tip of ears. Blue/White Porcelain China Horse - Marked on base made in USSR. Height approx 5"
Blue/White Porcelain China Horse. Marked on base - Made in USSR. Size approx. Condition - As New. ON THE BASES IT IS WRITTEN IN RED 'MADE IN USSR' WITH THE LOMONOSOV MARK. They date from 1992 ( present from friends). On bases is the Lomonosov mark & made in USSR. It will be a perfect gift for animal lovers. It's also a perfect addition to any porcelain collection. 7 cm in length & 10.5 cm at highest. Lomonosov Russianunique porcelain Safari animal. Yakut and fish made by the Lomonosov factory in the ussr period. Russian boy and dog by the Lomonosov factory. RUSSIAN LOMONOSOV IMPERIAL. Has the Russian mark on the base in red writing, made in Russia. All gold gilding intact and bright. Beautiful colouring of blues white and Gold. This quality little teapot with a teapot lid has vibrant colours and is in a perfect condition. 13.5 cms high. 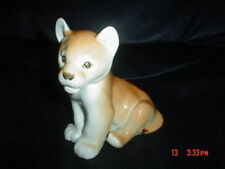 Job lot of 3 beautiful porcelain USSR Lomonosov animals - Lion cub, Seal, and a Winter Stoat (Ermine). They are marked underneath Made In USSR. Dulevo dancing girl,verey good condition small chip to side of bace marked to bace. 15cm high. 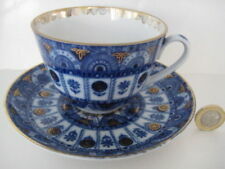 2 x Lomonosov Wrens both in v.g.c. 1970's. 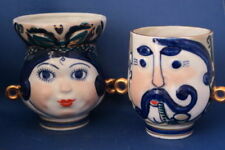 13 cm h ig h.
SET OF 3 PORCELAIN LADIES. SMALLEST APPROX 15CM TALL. 6 x Job lot of Lomonosov Lion Cub's - all in good condition apart from 2 which have small chip's to ear's (see pic 2).